Stephen R. Chapman's (center, with award) All American Air won the award for Outstanding Small Business at the recent National Philanthropy Day Luncheon, hosted by the Association of Fundraising Professionals Florida, First Coast Chapter. Jacksonville – Community Hospice & Palliative Care has carried forth a 40-year legacy of compassion due, in large part, to community support, especially from like-minded organizations that focus on enriching the lives of the residents they serve. 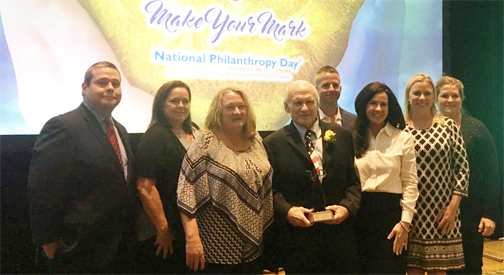 In celebration of this month’s National Philanthropy Day, two longstanding Community Hospice partners were honored at a very special National Philanthropy Day luncheon by the Association of Fundraising Professionals Florida, First Coast Chapter for their tireless dedication to the growth of the communities they proudly serve. Very soon, with the outstanding largesse of Stephen R. Chapman, Community Hospice will be expanding its commitment to St. Augustine and St. Johns County residents with the new Stephen R. Chapman Family Community Campus. This Community Campus will further a promise to promote the health and well-being of St. Augustine and St. Johns County residents by offering health services and ensuring individuals are prepared to face the challenges of aging and advanced illness. Community Hospice is honored to collaborate with All American Air and Riverside Rotary Club in the spirit of mutualism to continue uplifting local communities with mission-led focus.